Last night I met up with two friends for some Korean food. I suggested eating at Lighthouse Tofu because one of my awesome readers (Sup Mark!) reminded me this place existed. I used to work right around there and always thought they only served Soon Dubu Jigae (Spicy Tofu Stew), so I never went. They restaurant has their own private lot with the closest metro being Twinbrook on the red line. It's pretty big on the inside and wooden. I didn't see any tables with the personal grills or table vents either. Their menu is pretty small. It's actually just a small menu inside of a plastic cover that is already standing on your table. They offer maybe 15 items, with a lot of it being the soon dubu jigae and Korean pancakes. They do offer BBQ too. There wasn't a huge assortment of pan chan (appetizer/side dishes). About 6 different kinds. The kim chi wasn't spicy to me because of the bean paste in it. I've never seen this before, but apparently its common. It's rice with tea. You wait for the rice to get soft and you scrape it off of the sides and eat/drink it. It's very mild, but quite refreshing and strangely addictive. I ordered a 'Kim Chi Pancake (large) for $13.99". OMG, it was so good! I loved it, and a large is a good size to share with others if you plan on sharing other foods. I was actually able to finish all but one slice myself. The flavor is great, very thin, and just crispy enough. The dipping sauce is to die for. 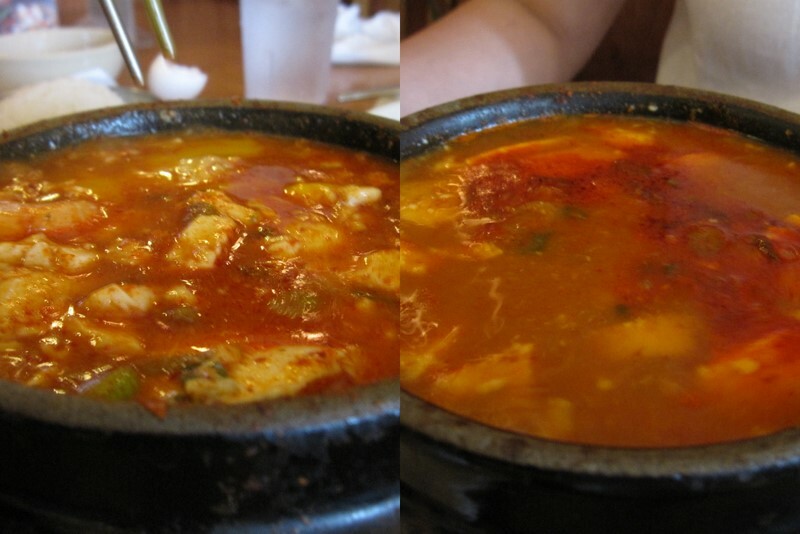 My friends both ordered Soon Dubu Jigae. You can specify the spicy level, and they both got the most spicy broth. I tried the seafood one and was coughing. Good flavor though, and they give you an egg to crack into the broth. The service was nice and the women wore traditional outfits (han bok), so cute! The food came out fairly quickly. I'd say its good for faster dinners since you're not BBQing the food yourself, and the menu is pretty small. I think Korean restaurants are overall pricey, so this one wasn't any different. This weekend I was able to meet up with James Millhouse Jr, owner of Millhouse's House of Rolls during one of his biscuit tastings. I first met James last year at the Metropolitan Cooking and Entertainment Show where his angel biscuits were so memorable. In 1994, James' mother taught him the recipe for angel biscuits, and after some revisions he debuted his biscuits around the holidays in 2001. They were a huge hit! His flavor variations happened a few years a later and was encouraged by loved ones to start his own business. Now James is full speed ahead attending conventions, starting a dry mix line and instructional book on how to create flavor variations and pre-made biscuits. Q. What are Millhouse rolls? A. Our version of angel biscuits is like a cross between a traditional buttermilk biscuit and a yeast roll. It is tender, flavorful, and easy to make. These are the Original Angel biscuits. They're slightly sweet and insanely addictive. These Banana Walnut ones were my favorite! I ate 3 of them, and they had the perfect balance of sweetness, nuttiness and banana. James has tried so many different variations of his biscuits including peppermint! Very interesting, haha. You can tell he is very passionate about his product and excited to share them with others. I look forward to the pre-made biscuits and the dry mix! He will be at the 2010 Metropolitan Cooking and Entertainment Show and you can check out his other events on his News page. Last night my friend Evil Ben was craving pho, so we hit up his favorite place, Pho 95 in Richie Center. That shopping center has India Grill and Jumbo Jumbo Bubble Express too. So there is a lot of free parking, and the closest metro stop is Rockville on the red line. We arrived 30 minutes before they were closing, hence the lack of people in the shot, but there were some people that came in after I took this. The place was very clean and bright. We both ordered a 'Vietnamese Ice Coffee with Condensed Milk' for $3.50. It was perfect! It was just as strong and sweet as I like it. We both ordered small bowls of pho. I got the '#15- Slice of Eye-of-Round Steak' for $6.50. It was good, however not flavorful enough for me. Ben likes the clean tasting broth that allows for the noodles, meats and herbs to shine. The herbs were very fresh though. I ordered a 'Rice w/ Grilled Pork' ($8.50) to-go for the bf, and he liked it a lot. I like how they serve other Vietnamese food other than just pho. Our server was SUPER nice and friendly, which left a good impression on me. I'm still a die-hard Pho 75 fan, but they don't offer any other food. I also liked Pho 95's relaxed environment. For Mother's Day, I was given the tasks of appetizer and dessert. My family is Vietnamese so I wanted to impress them by making something Vietnamese for the FIRST time ever. I found the perfect recipe on Ravenous Couple for Pate Chaud. They are similar to empanadas, but taste different and are more flakey. This was a very easy to follow recipe, and a great blog for getting into the world of Vietnamese cuisine. Thanks Hong & Kim! My version is slightly different from theirs but only because I'm lazier, haha. I forgot to picture the fish sauce and black pepper, but it's a pretty short ingredient list. Soak a small amount of the noodles in warm water for about 10 minutes so they become soft. Chop up your onion, carrots and noodles. Mix chicken, onion, fish sauce, pepper, noodles and carrots together! I couldn't find pre-cut squares, so I just rolled mine out and cut each sheet into 6 squares. Put a little meat on one side, fold over into a triangle. Seal with egg and use a fork to close the edges. Then brush egg on top so they get golden brown in the oven. Pop them into a 400 degree oven for 40 min. Since mine seemed bigger than the original recipe, it took longer, where as theirs took 15. So I'd just monitor them until they're golden brown and cooked on the inside. They were a HUGE hit! Everyone was very impressed and it was really easy to make. It has just the right amount of salt, and the flakey pastry is so good. I want one right now! I actually prepared the meat the night before to save time. My family isn't big on sugary cakes, so I decided to make Smitten Kitchen's Raspberry Buttermilk Cake. I've made her Cream Cheese Pound Cake before, which is now a staple dessert for me. Whisk together flour, baking powder, baking soda, and salt and set aside. In a larger bowl, beat butter and 2/3 cup sugar with an electric mixer at medium-high speed until pale and fluffy, about two minutes, then beat in vanilla. Add egg and beat well. Place raspberries evenly over top of smoothed batter. If the raspberries are 'upright' they won't sink into the batter as much while in the oven. That's you're preference though. Bake for 20-25 minutes and is golden. Cool in pan 10 minutes, then turn out onto a rack and cool to warm, 10 to 15 minutes more. Invert onto a plate. I sprinkled some powered sugar on top just to make it a little fancier. The cake was a big hit too! Great flavor, and very easy to make. The IT guys at work invited me to lunch and we went to a Chinese restaurant that one of their aunt's recommended. It's located in a very quiet neighborhood shopping center with plenty of parking. It's kind of far from any metro but the closest one would be Shady Grove on the red line. The place is a good size, and kind of looks like it was an Italian place back in the day. They offer a lunch buffet: 3 entrees, rice or lo mein for $6.40 from their front counter. You can also order off of the regular menu, or order one of their lunch special deals. I ordered off of the menu and got the 'Sesame Beef' for $7. It was a large portion, but it tasted very smokey and salty. I ate 1/2 of it, took the rest back because I'm not a fan of wasting food, but I wasn't feeling too great, so I ended up not eating it for dinner. My other coworkers said their wonton soups were too watery, the shrimp on the buffet was too salty, the sweet and sour chicken was too sugary, and eggrolls and lo mein were mediocre. The service was fast and nice but it wasn't busy at all. There were a lot of staff kind of standing around. Food wasn't great, so I'm not sure if I'll be coming back. My favorite bubble tea place (Bubble Tea Cafe) is closed on Mondays, so Evil Ben and I went to try Jumbo Jumbo Bubble Express in Ritchie Center. There is a lot of parking and is in the same shopping center as India Grill. The closest metro stop is Rockville on the red line. It's a very small place with a counter top and around 5-6 tables. The decor is simple but nice. They even have granite table tops for some of their tables, which is a nice touch, except then they have folding chairs to go with them. I ordered a 'Small Almond Milk Tea' for $2.95. I thought it was good but maybe a tad bit sweeter. The bubbles were cooked to the correct consistency, which was nice since hard or slimy bubbles can be annoying. Evil Ben ordered a 'Small Coffee Milk Tea' for $2.95. He would have preferred it to be sweeter because it tasted more gritty and burnt. He also found the bubbles to be the correct consistency. Overall the drinks were ok, nothing out of the ordinary. Service was fine. The place is a casual hang out spot that also serves a small menu of affordable Taiwanese food. We didn't order any food, so I can't comment on that. There bubble tea menu doesn't offer Thai Tea, which is one of my favorites. But they do offer 2 flavors I was unfamiliar with: Winter Melon and Lover Fruit. This was my family's 'go-to' Korean restaurant for every special occasion. I've been here countless times in the past, but it's been probably 2 years since I've last been. My friend Pan and Sqrl (check her amazing baking blog) and the bf met up there for dinner. They have a parking lot on the side with meters, but are free on the weekends. The closest metro stop is Wheaton on the red line. The interior has a middle section and then different rooms with more tables. They offer tables with grills and without depending if you want to cook your food at the table or not. They also have a sushi bar. As a kid I used to love looking at the mini indoor pond with all the fish. Menus with pictures are the best! They have a pretty standard menu with Korean BBQ, soups, rice dishes, noodles, Japanese food and sushi. I think they gave us a decent amount of ban chan. I've been to some places like Yechon where it covers the whole table. The kim chi was very good that day, I have to say. For our appetizer, the bf and I shared a 'Sushi' for $8.95. I liked how the rice were like little boxes. We all shared 3 different kinds of meats. 1st we got the 'Bulgogi- Thin slices of marinated beef rib eye' for $18.95. I thought it ok. Tasted better wrapped in the lettuce with rice. We then got the 'Galbi- marinated prime short ribs' for $22.95, which is my all-time favorite kind of Korean bbq and food at Woomi Garden. It's sweet and the best I've had from any restaurant. Lastly was the 'Jaeyook Gui- thin slices of marinated pork in a spicy sauce' for $18.95. I wish it was a little sweeter. I didn't find it memorable. We killed all the food...oh so full. After the meal was done, they gave us 'rice punch' which was really good and sweet with rice on the bottom. After dinner the bf and I went to H-Mart down the street to get some Asian snacks! After dating the bf for a while, it's been hard to eat at Korean restaurants because I think his mom's cooking is the best. So with that said, I think the galbi was excellent, but the bulgogi and jaeyook gui were mediocre. So if you go, just order that. The portion sizes were small for the price too. The cooked down meat was the size of a small appetizer dish for $20. The service was nice, I enjoyed the atmosphere, and it's great for large parties. If you're Korean, speak it! My bf ordered in English, then as we were leaving he said thank you and bye in Korean, and our waitress told us if he had spoken in Korean earlier, we would have had better care, lol. So just an FYI you guys.